Nuance, the company behind the voice recognition system on many phones and which most likely played a part in the Siri Assistant application on the Apple iPhone 4S, is said to have purchased alternative keyboard designer Swype, for $100 million. Swype allows users to use a finger and slide it from letter to letter to form words and sentences without ever lifting the finger from the screen. Many current speed records for typing on a smartphone keyboard are held by Swype users. The keyboard is often pre-installed on many new Androids models, right out of the box. 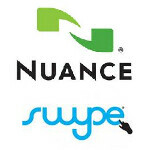 Update: Nuance has now confirmed that it has acquired Swype for "approximately $100 million," according to Thisismynext. Nuance is known for its Dragon line of programs and did some work behind the scenes to help develop the Siri Assistant app that Apple has high hopes for. The Cupertino based firm showed off the natural language recognition technology during the introduction of the Apple iPhone 4S on Tuesday. Neither Nuance or Swype would comment on the report of the deal. The Seattle based Swype first launched its keyboard in 2008 and it will soon be on over 100 million devices. Nuance owns the rights to the T9 predictive text app that is still used on many featurephones today. Ironically, the T9 keyboard was developed by Cliff Kushler who co-founded Swype. For those who have been under a rock somewhere, check out the video below on how to use Swype. I smell the possibility of swipe on the next WP7 and iOS. Just a possibility.